Just a few lures and traces, lure rod, net and mat are all you need. Before I go on just a few words about the kit I use as I have carefully selected it over the years via trial and error and I now feel it fully meets with the requirements. Rod and Reel – The rod above is a Fox Trek 8ft lure rod. It breaks down in to 4 sections which makes it ultra portable. If it is portable I am more than likely to have it in the car when ever the situation strikes me. Remember that the rod you have with you is worth 10x the rod that is at home. Note that the rod is only 8ft, this is deliberate as not only is a smaller rod easier to carry through bushes and brambles it is also a hell of a lot easier to cast all day. I have seen anglers using 12ft carp rods as lure rods and trust me you soon get shattered. The reel is a small framed shimano, the make is unimportant, what is important is that it is small and lightweight and filled with 20lb braid. 20lb braid casts like 8lb mono but is tough enough that you can straighten the hook if your lure gets snagged, useful and worth every penny. Net and Mat – you will notice that the net in the pic above is only a 32 inch. This again is deliberate, if I were fishing static I would use a 42 inch but I need to be able to carry it and deploy it with one hand and so a 32 inch is the best compromise. The mat is a “Ron Thompson”affair and is fairly thin. Some carp anglers would be aghast at such a net but the pike I catch are a lot smaller then the carp and so don’t need the padding. 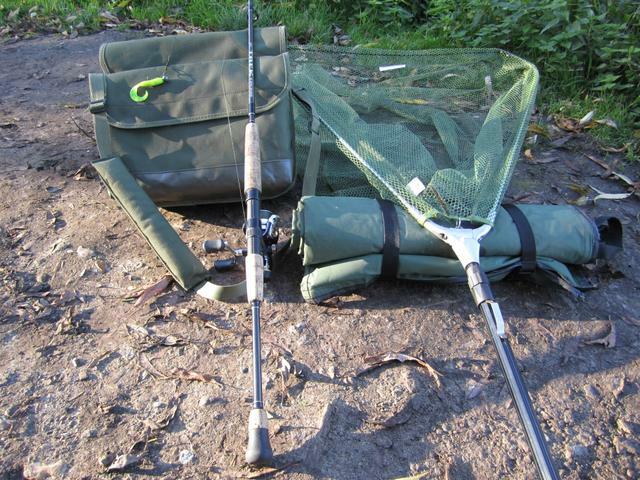 Note that if I were fishing with waders in the water I would dispense with both net and mat as they are not needed. On to the lures, I love rubber lures, the smell the feel… sorry wrong blog 🙂 Anyway I love rubber lures, they are cheap and catch a lot of fish. Due to the lead jig head they go a long way and if you need to fish near the bottom there is only one choice. Just remember to set them up the right way with a stinger on wire, click here for a demo of how to do this. 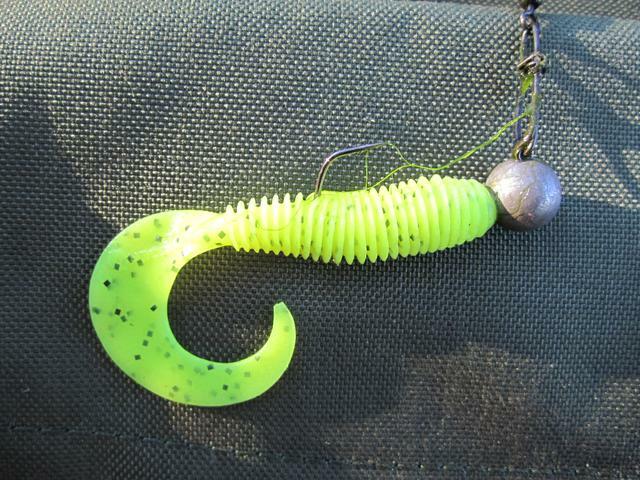 If you are not fishing shad’s and are using rubber worms than a simple single hook set up like so is perfect. It is interesting to note that fishing this style in South Africa is called “Drop shotting” and is very popular. I find that it works very well over here as well as due to the way that the lure orientates its self with the hook upwards you avoid most of the weed as well. Rubber worms are available in all sizes so if you feel like a go at the perch just drop the size down and have a pop. Other important items – Other things you will need, warm clothing and hat, sunglasses and forceps. You might be mobile but you will need to have worm clothing that is light and breathable. I recommend a goretex outer shell and a decent fleece with a full zip so that it can be opened if required. Good walking boots are a must as depending on where you are you might be covering quite some ground, make sure that they are also waterproof. You wont be wading in them but you might be in boggy ground. Wet feet will really not make your day and might cause to you call the session short. Make sure that you have your hat and sunglasses with you, what might start off as a dull grey day may end up a glorious sunny day, remember that in the winter the sun is lower in the sky and will be in your eyes. Lastly forceps, I bring several sets as you never know when you might need them. Generally lure caught pike and perch are not hooked too deeply however there is always the exception and once I had to go in deep to retrieve a rapala fat rap that a pike had inhaled as it hit the water. You never can tell and missing forceps are a reason to end the day, no forceps no pike fishing. Well this is the end of the post I hope that I have inspired you to get out there and have a go for the pike. You don’t need much in the way of tackle and it is great fun. Whilst you are staking pike you can also be eyeing up next years carp swims as the lakes ( when they defrost) will be empty. Get out there and have fun ! What do you think ? why not post your experiences and comments below ? if you have a particular question that you would like answering either post it in the comments below or send me an email using the “contact Me”button that the top of this page. Previous Previous post: We have a winner ! Next Next post: you think you can cast a fly ?